With the EZ Jet Water Cannon, you’ll get the power of a pressure washer and the convenience of a garden hose combined. It attaches to any garden hose and lets you clean your house, cars, boats, RVs and decks with ease. You can also use it to water you garden, spread fertilizer and much more. 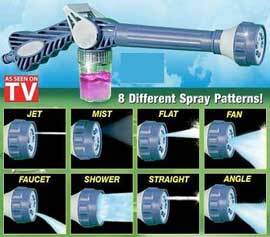 The EZ Jet Water Cannon makes cleaning the tires and rims on your car a breeze. Use it to reach high windows or blast away dirt and grime on your sidewalks and walkways. There are 8 different built in hoses on the EZ Jet Water Cannon that you can adjust to with just the turn of a dial. You can set it to be powerful enough to reach second story windows or gentle enough for watering fragile plants and gardens. The EZ Jet Water Cannon is capable blasting your pool filters clean. Plus you can also fill it with liquid fertilizer and treat your entire lawn quickly and easily. My Dad is notoriously tough on his carcare tools as he spends at least 4-6 hours a week washing his primary, secondary, and toy vehicles. Long story short, he has requested an additional ez jet water cannon for his office and another for his riverlot. Good quality, highly durable, and the price is right.